A wonderful copy, although a bit worn and soiled, but whole and complete. Housed in a custom quarterbound leather and marbled paper slipcase. 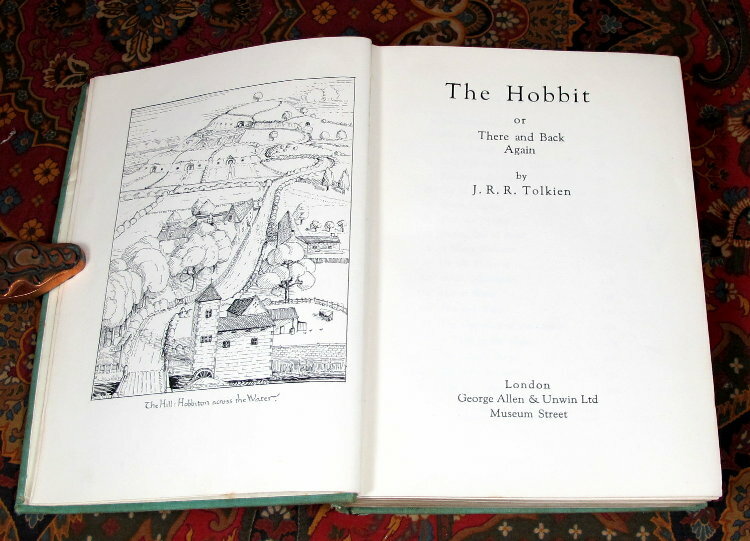 This is the 1st printing of 1937, featuring the black and white frontispiece of The Hill: Hobbiton across the Water', with all illustrations by the author. A wonderful copy, although a bit worn and soiled, but whole and complete. Housed in a custom quarterbound leather and marbled paper slipcase, to house and protect this classic. This is one of the original 1500 copies,1st (First) Impression of the 1st (First) Edition that was published 21st of September 1937. It has the two maps and ten illustrations, by the author, all in excellent condition. The original decorative map endpapers have no markings or previous owners names. 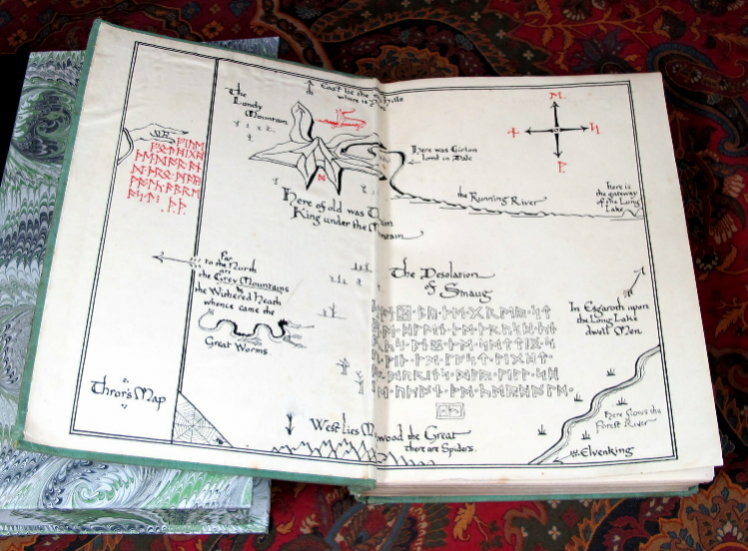 Thror's Map in the front, is in relatively clean condition with a small scrape at the bottom of the pastedown side. The Wilderland Map is stained across the top of the pastedown side, and some rolling and bubbling along the gutter, with a small booksellers sticker to the bottom of the pastedown. The text block is relatively clean and bright, with a few minor smudges scattered throughout the book, none noteworthy. The top edge shows a bit of a damp stain and is dusty and faded, with the green topstain still visible. 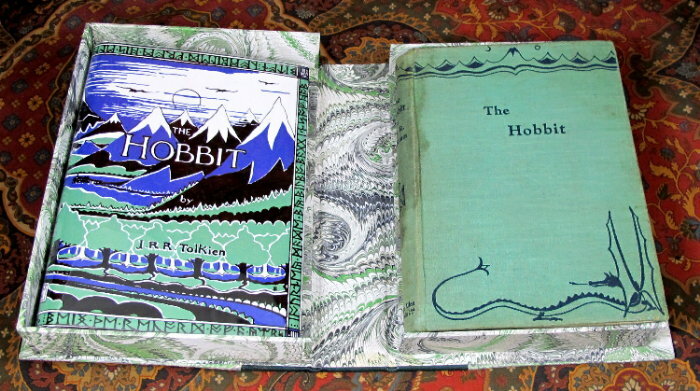 The cloth covered boards with the dark blue decoration of Tolkien's Mountains and Dragon design, are stained along the spine and the rear panel. The tips of the spine are rubbed with some loss, revealing the boards underneath at a few spots. A couple of the tips are rubbed thru as well, and a bit of insect damage to the bottom edge of the textblock, on the surface only. 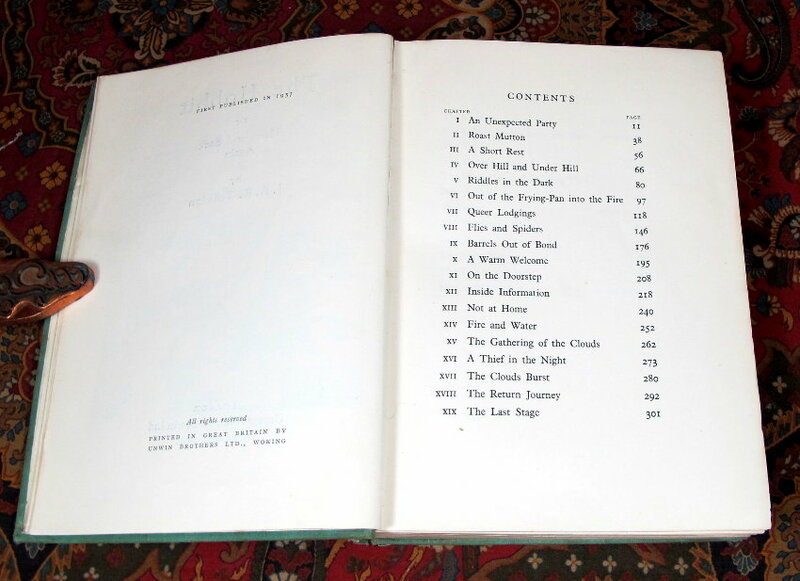 A wonderful well loved copy, exceedingly scarce in any condition in this day and age. A tremendous opportunity to acquire this classic of modern fantasy literature. A facsimile of the original dustjacket is provided with this book.